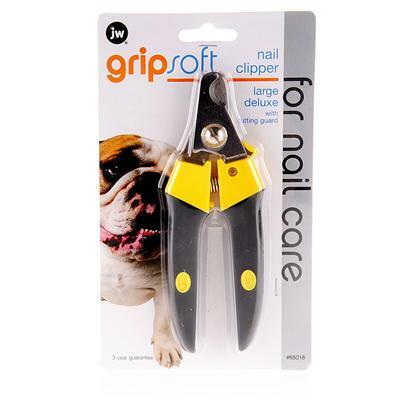 Cutting your dog's nails can be tough, but even squirmy pets are no match for the JW Gripsoft. The cutting guard helps prevent over-cutting and reduces accidents. If your dog has just had a bath, the non-slip soft grip gives you control over your slippery pup. All of JW's grooming tools are ergonomically designed and require less pressure to manipulate them making it easier on you and your dog. Locate the nail bed, or quick, inside the dog's nail. The quick is easily visible in light-colored nails but can be difficult to see in dark nails. It is important not to cut to the quick, so cut small amounts. The cutting guard helps you move slowly and not over-cut. If you accidentally do cut the quick, apply styptic powder to help stop the bleeding. After trimming the nails, smooth the sharp edges with a nail file or emery board.